Alrighty, yesterday I went over a few new features after they were released, but that was just so you didn't think they were broken :) If you haven't read that post yet, please read it here, so you understand a few limitations of the new features until some historical post processing has been completed. As should be evident, to make your split tests valid, you need a good sample size. There was absolutely no difference between what these visitors saw, yet the conversion rates are 49% vs 37%. I'll let this run indefinitely, at least until we get two different registration pages to actually test, to see what the differences end up being. They should converge with time. More details on setting up split tests are included on the main goals setup page. When you create a split test, you can choose what specific goals you want to track conversions for (as we did here, we're just tracking our "new user" goal instead of all goals), or you can let it default to tracking conversions for all goals. Both options have their ups and downs so it depends on what you're doing. If you want to use a GUI interface to design your split tests, we have partnered with Visual Website Optimizer to provide that for you. More details on that are also on the goal setup page. Previously we were tracking the time of someone's first visit to your site, but now how many times they visited. Nor did we keep track of their first session ID. That's all fixed now! When viewing any visitor's details, you'll see how many total times they have visited your site, and the time of their first visit is now a link directly to that session, so you can see what they did on your site and how they got there (search etc) the first time they showed up. We've updated the main goal report to include a few new pieces of information. Tracking conversions is great, but wouldn't it also be nice to know how long it takes the average visitor to convert? That's exactly what we've added! Here's a snippet of our goal report, showing two goals that are very important to us - how many new people are registering, and how many people are upgrading. We offer a 21 day trial when new people register, but on average people are upgrading after only 14 days. That's fantastic! And for new users, it looks like the average person registers on their second visit after a 4 day lull from their first visit. Interesting! Of course, this is only about 12 hours of data, so it doesn't tell the whole story. A bigger sample size will give us a more accurate picture of how you use Clicky. When viewing any report, previously we had an extra column for conversions and conversion rate for each segment. However, the way we were calculating this wasn't taking into account which specific goals that segment was completing. It was just keeping an overall tally, and when you clicked the conversion number, it would filter your visitors down to those who had completed "any goal" for whatever segment you were viewing. Now we'll show way more up front. As you can see int he screenshot below, we've added inline revenue to the reports, and when you click on the conversion number, it pops up a menu showing you all the individual goals that segment has completed, ordered most to least. You can click on any of those goals to immediately filter your visitors down to just that segment+goal, or click the "all visitors" link at the bottom to view visitors from that segment who have completed ANY goal. That's all the major stuff. There's a few other little goodies here and there. e.g. all split testing data is available via the API, and has been added to the iPhone web app too. Hope you enjoy! More good stuff from the best analytics service online. Thanks! Nice stuff, i've only noticed a big increase in the avg time of visitors on my sites. Is this a bug? Again, Fantastic upgrade , I look forward to getting this working for us! As you are going to be tracking the number of visits by a single user, could you also store the search terms, or referrer link that were used on each of those visits. For example, a lot of times the first keyword used by a person to find a website is a generic keyword. And then following that a brand keyword via search will be used in order to get back to that site. In my sector as I am sure with others, knowing the acutal first keyword that was used to bring the visitor is something that would have real value. You can hack Google Analytics to give you this information, but GA is not for us it is !!! GetClicky continues to exceed our expectations. Moving from GA to GetClicky was one of the best online decisions we made last year. - The loadtime is pretty slow when we try to filter reports. Again, we have more than a few hundred thousands uniques per month, so I understand why it loads slow. But, as it is becoming harder and harder for me to understand why anyone would use anything other than GetClicky -- this is a painpoint that may push other large clients away. I would be MORE than happy to pay extra for those features!! Maybe it could be an extra package available for purchase? Anyways - just wanting to share some ideas, because I do LOVE GetClicky and know you guys take all suggestions into considerations. Marc, this update should have had no effect on time-on-site values. Blobman, that's exactly what we're thinking of doing. Now that we can attach data at the absolute visitor level, there are lots of interesting possibilities. Carey, the limit on revenue is something we definitely want to fix. It's on my "major bugs" list. The speed of filtering is something I agree could use some improvement, but unless we started charging a ton more money for our service so we didn't have to put so many sites on a given database server, then it can't really be improved much. We like keeping our service affordable, so that we have that many more people using it and talking about it. I completely agree with Careys first thought, Clicky feels hospitable, homely yet with a taste of quality - like a fine wine! Interesting to follow your development of new functionality of Clicky! But I have some doubts about the possibility of tracing the very first visit session of an unique visitor. In my opinion is there not any known method today to follow an unique vistor for a long time, say for more than a 30 day period with any degree of certainty (if it's not based on a logged in vistors id data). Your ideas about the bounce rate and tracking the visiting time on such a singel page visit is also interesting and I have had some similar thoughts too (but with a bit different shade). Personal I found the bounce rate very odd and strange as a statistic value of interest. I have vistors visiting a singel page at one of my websites repeatedly in returning visits, without visiting any other webpages (for up to 70 times a mounth!). 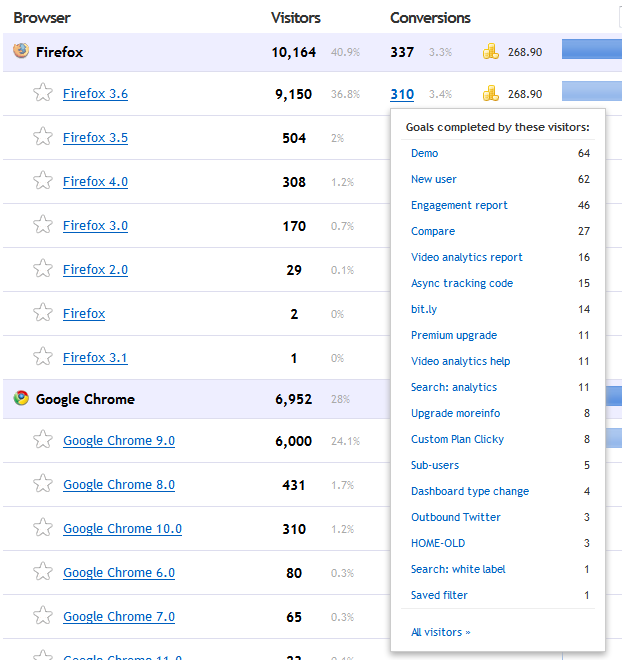 Adding these visits to a bounce rate gives me a false view of the visits of my website! So returning singel page visits of a unique visitor should not be rated as bounces either, I think.